If you’re a city slicker, then you may have never seen a field being plowed (or ploughed, for my UK friends). Plowing a field loosens and turns the soil so it can be planted with seed. It’s done one of two ways; a farmer will drive a tractor that pulls a heavy wedge through the ground or a farmer can also steer an ox to pull a heavy wedge through the ground, but both methods involve someone at the helm who knows the lay of the land. They look for obstacles and turn a corner when it’s time to. Without the farmer, the oxen stop. Without the driver, the tractor continues straight off the property to prepare the farmers barn or house for planting. Every three months, you and I work together to steer your fitness journey in the right direction. “What’s working well?” “What isn’t?” “Let’s adjust this and plan ahead for that.” Our coaches (including me) do this because we strive to grow professionally and be the best in our field. For us, it’s coaching development. For you, it’s a goal session. You get one every 3 months with your membership + an Inbody Scan! Your effort, sweat, and healthy habit changes are your ox. 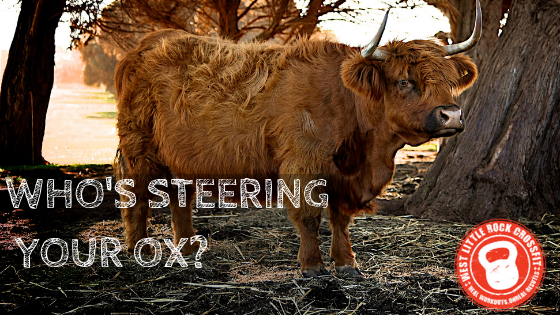 Oxen are strong, but only effective when given direction. Book your next goal review today, and let’s steer your fitness in the right direction. Cheers to reaping what you sow!